The May 2010 Daring Bakers’ challenge was hosted by Cat of Little Miss Cupcake. Cat challenged everyone to make a piece montée, or croquembouche, based on recipes from Peter Kump’s Baking School in Manhattan and Nick Malgieri. This was a challenge I looked forward to. I thought it would be a great treat for Memorial Day with Nic coming home. But Nic isn't coming home, and I lost my desire to bake it. But, Christina showed interest in helping, so I said WTH, let's make it. I'll have my pity party over a glass or 3 of wine. Hopefully my sweet son will get a quick weekend home soon. I have been making variations of croquembouche for many years. Not using pastry however, using truffles. I am sort known for my truffle tree by old friends. It has been a number of years since I made one, but I am thinking blow-out Christmas party this year and a truffle tree will make its reprise. 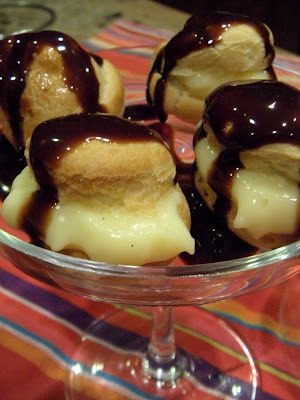 But for today, Cream Puffs. Pate a choux is the most basic of pastry. It mixes up in a hurry and makes magic in the oven. That fabulous, airy puff just waiting for pastry cream. Here is the recipe I followed for the puffs. Very easy. Using a clean finger dipped in hot water, gently press down on any tips that have formed on the top of choux when piping. You want them to retain their ball shape, but be smoothly curved on top.Brush tops with egg wash (1 egg lightly beaten with pinch of salt). Lower the temperature to 350◦F degrees and continue baking until well-colored and dry, about 20 minutes more. Remove to a rack and cool. Traditionally vanilla pastry cream is the filling, and I am a basic kind of girl, my choice. You can use any number of recipes. Here is the one I chose. Continue whisking (this is important – you do not want the eggs to solidify/cook) until the cream thickens and comes to a boil. Remove from heat and beat in the butter and vanilla. Pour cream into a stainless steel/ceramic bowl. Press plastic wrap firmly against the surface. Chill immediately and until ready to use. The final step is to stack the profiteroles and surround it with spun sugar. This is a show stopping technique that is really a challenge in Memphis in the humidity. Since I don't have 20 people to eat these darn things, I couldn't fill and stack the whole batch at once. After the filling is pumped into the pastry, the clock is ticking. It doesn't take long for it to go from fabulous to soggy, so no preparing ahead. Since there were only 2 of us indulging, our tower was not to be. Four delicious cream puffs. But delicious, regardless of the size of the mountain. Not exactly Memorial Day food right? One of my favorite things about summer is the Farmer's Market. Memphis has a fabulous one downtown every Saturday. The assortment of things offered is staggering (so are some of the prices to be honest). For the last 15 years I have been patronizing the Shelby Farms Farmer's Market at the Agricenter which I love and is so charming in the big red barn. On the weekends there are more vendors and a good variety and great prices to boot. Well, Germantown has declared its own market on Saturday mornings in the parking lot of Germantown Hardware. With only 5-6 booths, you can't really buy dinner here, yet, but I did find this gorgeous baby bok choy. The Asian farmer explained to me it was best stir fried with the meat and seasoned with whatever I seasoned the meat with. Hmm. I get into this no oven or stove mode in the heat, and decided to do a little Googling. 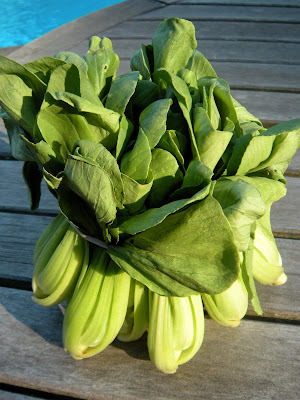 I found this blog on baby bok choy Grilling was very appealing. I decided to shortcut his steps and for the most part it worked about beautifully. Except of course the near death choking experience. More on that later. I soaked the bok choy as recommended, about 10 minutes in cool water, which was good as it had wilted a little in the fridge. Soaking also helped rinse out the sand and grit embedded in the stalks. My baby bok was much smaller than the other blogger's, so cutting in half didn't seem like a great idea. I decided to grill them whole. And since mine were smaller, I decided to not trim off the leaves which that blogger did and stir fried. I left them damp as I felt that help steam them a little on the grill, and I tossed them in olive oil and sea salt. I put them on a hot grill and closed the lid. After about 5 minutes, I turned them over, the smell was fantastic. The outer leaves were charred but the bodies were browning nicely. After a few minutes more, I removed them from the frill and drizzled the whole platter with balsamic vinegar. They were beautiful. As usual, I went first, with Scott and Christina watching my every move. I took a bite off the top (no knives or civilized utensils here) and it was a little stringier and tougher than I was prepared for even though it was well charred at the top. So my little bite got a little bigger, and before I could really take it in and chew it, I started to choke. Now I'm not sure how my family would react in any other emergency, but I was at death's door and they couldn't stop laughing. Needless to say, I saved myself. After that, the platter of grilled baby bok choy was just for me, no takers. Strange huh? Oh well. Next time, trim the leaves, but leave the hearts whole. The heart of them is crunchy and delicious. Yes, I saw the original Star Wars at the theater. The Capri in Clinton, IA, I am guessing I had just finished the 7th grade. I wasn't really impressed. I liked it, but I was 13 years old. I really liked Princess Leah's hair, that I could probably obsess about. So I recognize when things are bigger than we imagined, and Star Wars, after all these years hasn't missed a beat, and has drawn in generations of fans. I liked the movies much better as an adult with all the underlying stories. Then the decorating. I hate black frosting. You really have to wrestle with the colors to make it black black. Mine was shiny and pitch black until it dried and got all dull. Same with the white. Whitener, which is essential really dries out the icing. I really have so much more to learn. Aside from the black and white, the rest of the colors came pretty easy. Maroon, teal, moss green, brown, yellow, grey, lighter moss green, darker teal, let's see that's 9, plus the black and white, so 11 colors. That's a lot for 4 cookies. But remember every color had a bag and a tip. I wish I had made 20 of each to really practice on them, but there are many more cookies to go right now. I enjoyed the difficulty and would love to tackle them again, as practice makes perfect. But, for now, well, perhaps Yoda, (my favorite cookie BTW) says it best: “Remember, a Jedi's strength flows from the Force. But beware. Anger, fear, aggression. The dark side are they. Is there anything as cool as your "tweet of fame"? It used to be your 15 minutes was the pinnacle, but now if you can get a tweet by someone with a posse of followers, well, that just rocks! So, who you ask? Iliza Shlesinger, winner of The Last Comic Standing is the host of a pilot called That's So Cute. I was asked to bake some Sweetie Petitti cookies for the shoot and it turns out that not only is Iliza funny, she has great taste in cookies and she dropped a Twit Pic. I sent out 3 sets of the show name to my sister Lori and was told they had been put in the freezer....Panic! 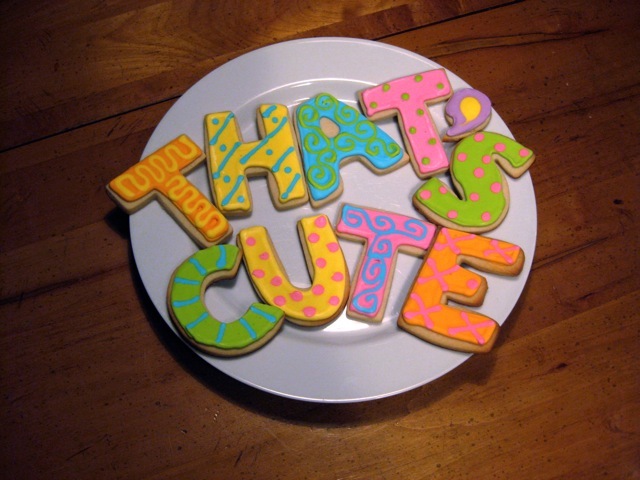 In the south when anything comes from the freezer it weeps in the humidity so I was afraid of the quality of the cookies when they thawed. So Lori decided she needed to test them and took out "SO" , thawed them and ate them in the name of culinary investigation and they survived. So what to do with "THAT'S CUTE" that was left over? She decided to substitute them for a friend's birthday cake, why not? That left a couple sets for the pilot which apparently was very successful. Look for it soon on a network near you! And good luck Iliza, nice tweeting with ya!